We are awaiting MASCOT's landing on the asteroid Ryugu on October 3rd, 2018. The landing unit was developed by the German Aerospace Center in cooperation with the French space agency CNES and the Japanese space agency JAXA. The data processing and evaluation is managed by the S.E.A. product SpaceMaster*, which is operated in the ground control center at DLR Cologne. After the Hayabusa2 probe, operated by the Japanese space agency JAXA, reached the asteroid on June 27th, the landing unit will be dropped off from 100 meters above the asteroid on October 3rd and will touch the surface one hour later. The landing unit can move by means of jumping movements and take measurements on the asteroid surface at various points. The planned mission duration amounts to two asteroid days, which corresponds to 16 earthly hours. S.E.A. SpaceMaster* is a so-called TM/TC system, also known as Check-Out System. 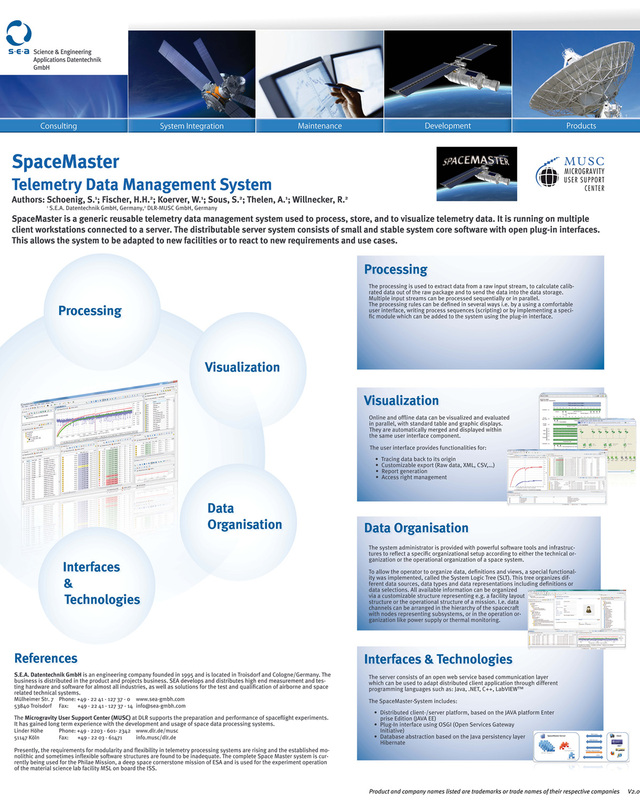 TM stands for Telemetry and includes the processing and visualization of data. The data will be transmitted from the landing unit to the ground station via the spacecraft. TC stands for Telecommand and refers to commands that are sent to the spacecraft and executed on the comet by the asteroid lander. Information about the Rosetta Land project can be found on the respective project page. The complexity of today”™s space missions requires new concepts not only for spacecraft and payload development but also for the experiment and mission operation itself. 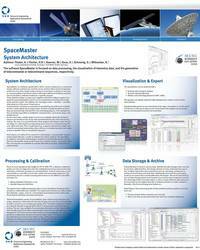 SpaceMaster the telemetry data processing platform matches the requirements of future space missions. The new telemetry development SpaceMaster is a modular and scalable software approach based on a JAVA Rich Client Platform. The software uses abstracted Client/Server infrastructures as well as abstracted data base functions allowing the exchange of communication or data base classes over the lifetime of a system. 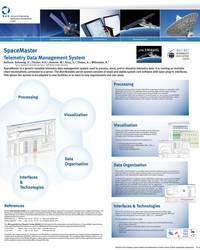 SpaceMaster offers the users all advantages of a modern data processiong software. SpaceMaster bases on a client/server architecture, consisting on a base system supplemented by various plug-ins. 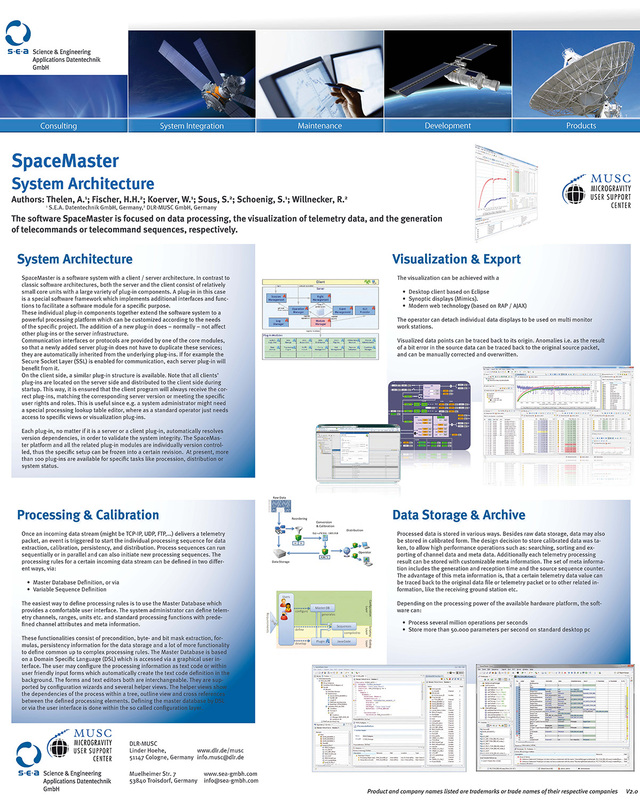 The graphical multilingual user interfaces allow configuration, operation, and maintenance of space systems. Plug-ins and user interfaces are managed by a central server. Wenn Sie weitere Informationen zu unserer SpaceMaster Plattform wünschen, sprechen Sie uns an. Gerne informieren wir Sie telefonisch oder im persönlichen Gespräch. In which Missions Spacemaster was used so far ? What was the development base for Spacemaster ? Spacemaster Development was based on a definition phase which addressed several hundred main requirements. What about software quality ? The software is developed according the classical way via SRD, ADD, DDD. Software components are tested with dedicated unit tests. 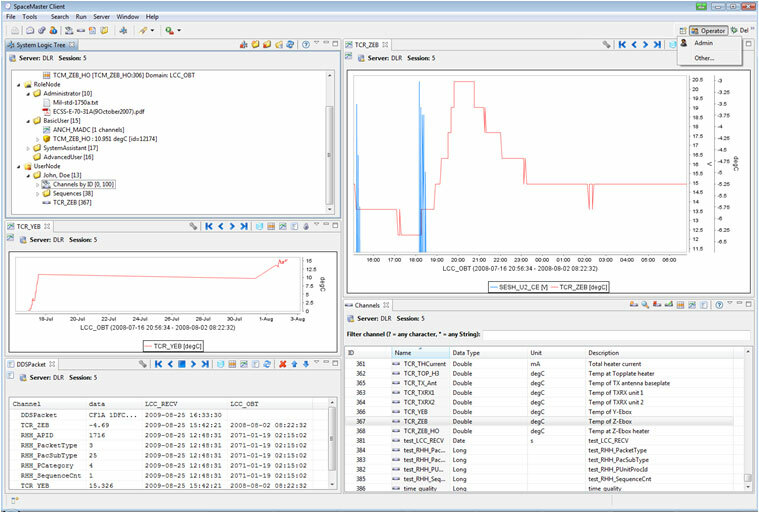 Defined telemetry process sequences can be qualified with code coverage analysis. Can I use Spacemaster only for flight activities ? No Spacemaster can also be used for ground reference systems tests and space operations. Different workspace and contexts make sure that there is no unwanted mix between ground and space systems. Is there a limit in the number of server and client stations ? The system is tested on “standard” desktop computers to allow quick look on some 20-40 client stations. The system has no technological limit in the number of clients, it is just limited by the available computing and network power. On which operating system can I use the software ? The complete software can run on windows or Linux platforms. Are there user manuals or training material available ? There is thousand page online help available to describe the many different GUI components. In addition there are also many tutorial on How-To a specific task. Do I need a special trained system administrator to administer the system ? The system is divided into several - so called - views to show only these control elements and windows which are special for a certain role or function. There are only very little tasks which require some administrative training. Nevertheless it is recommended to have a training session on how to setup a system from scratch. Does Spacemaster support different languages ? The standard language is English, but the system is designed to support also other languages, even Unicode based Charadterslike Chinesor japanescan be supported. How can I export data or import definitions ? Data can be exported via available export tools into variable formats. Most common format is Binary (for raw data export) , ASCII and XML. The import of existing processing definitions can be made with import plug-ins. Either a special import module is available or it can be user generated. In which programming language is Spacemaster programmed and why ? Spacemaster is programmed in JAVA. The reason is, that the code can be executed on almost every operation system, without any modification. Isn”™ t JAVA too slow for serious processing ? The code is always compiled and has a very high performance. Computers are so fast today, that the bottleneck in large systems is not the JAVA code, but the IO into data bases. I want to use Spacemaster, what is the cost or effort to start a small project ? The Spacemaster license fees are very little, about 12kEuro for the basic system. It is recommended to ask us for a support in integration and adaptation to your system needs. These costs can be variable and are dependent on the necessary complexity in configuration, setup and extensions. A typical mission setup can be configured within 6-8 weeks. Which database system does SpaceMaster support? SpaceMaster is based onto an the abstract persistency layer “Hibernate”, so nearly any kind of database which provides a JDBC Connection interface can be adapted. 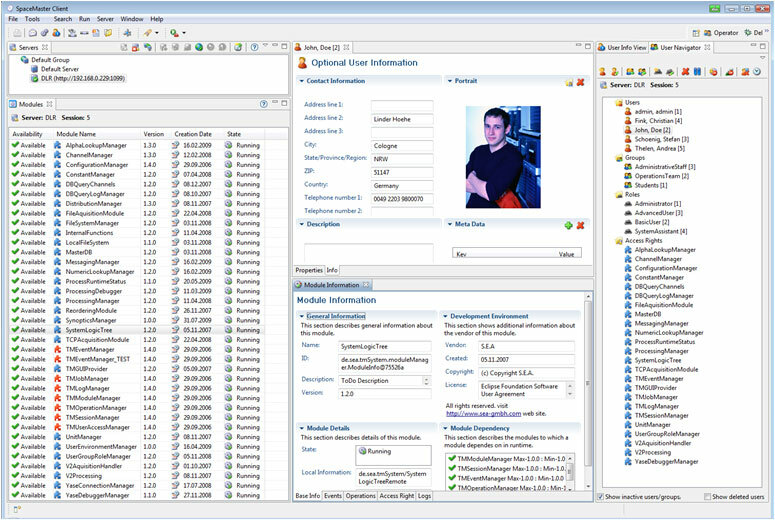 By default SpaceMaster is adapted to the open source database PostgreSQL. Isn”™t a relational database fast enough for storing calibrated data? In fact: Relational database aren”™t the fastest way to store data. 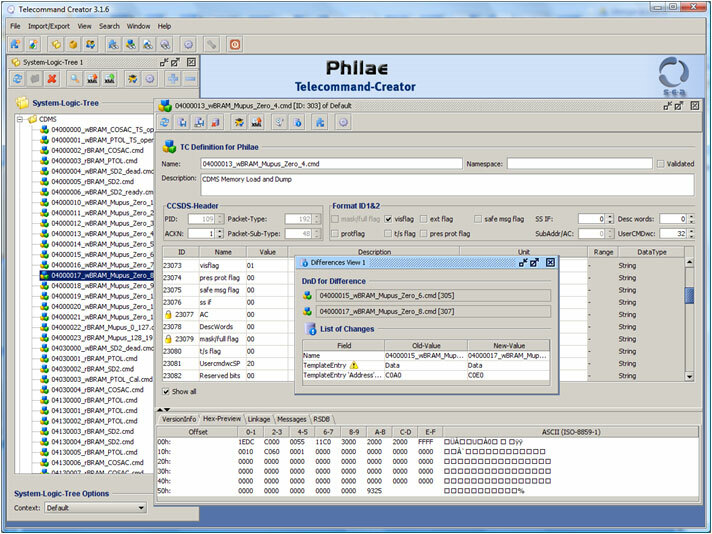 Therefore SpaceMaster can be configured to work with different databases in parallel. Every channel * is stored within its own database table. Every table (channel) can be configured to be located onto a different physical database server (database–system). SpaceMaster was optimized for PostgreSQL. SpaceMaster is able to store 50.000 Samples* per Second on a standard desktop PCs. The performance depends onto the number of metadata per channel and from the used hardware. In contrast: Typical databases are able to store about 1.000 Samples/s on standard desktop PCs. Storing more than 100KHz in mean wouldn”™t be a problem for SpaceMaster. Which acquisition does SpaceMaster support? The default installation of SpaceMaster comes up with modules for TCP, UDP and plain file acquisition. The system architecture dosn”™t make any assumptions or restrictions to the data acquisition sources. 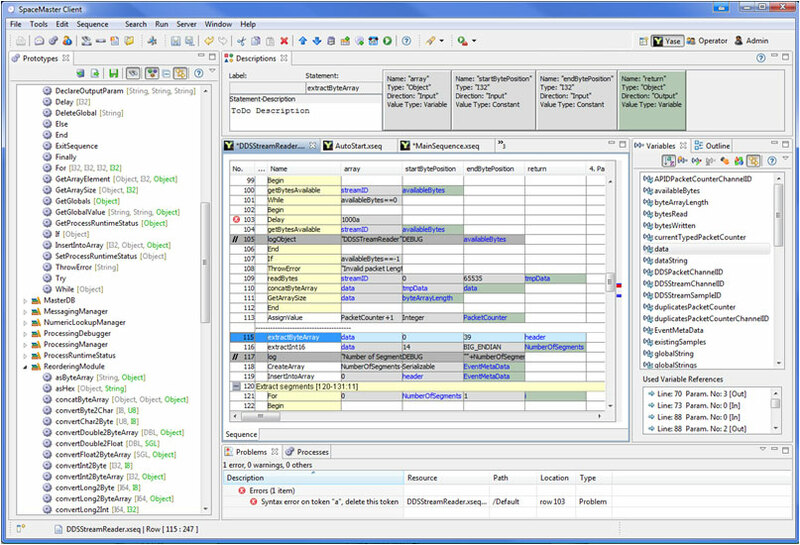 Multiples sources can be acquired and processed in parallel. A detailed tracking manager allows the user to detected which source is currently connected and how many data has been received by who. History information are also available for each data source. What happens if I receive bursts transmission? SpaceMaster stores incoming TCP data to the servers hard disk and processes the data in parallel by a different read pointer. As long as the data can be processed in mean faster than they are received, there won”™t be any problem. How can I adapted my existing application to the system ? Is there a API or any other interface? The system provides several standard interfaces: RMI (Java Remote Method Invocation) and web services is a good choice for a lot of system setups. The performance is fast enough for system configuration, data browsing, and export operation task. Online data might distributed by as plain TCP-IP stream for more performance. Plug-Ins written for SpaceMaster doesn”™t need to care about the communication interface. A plug In interfaces to the system and the SpaceMaster system is used as bridge between the external interface (i.e. a custom .net application) and to the plug-in. The advantage: If SSL is enabled, or XML-RPC id added as communication protocol all Plug-Ins provides the se interfaces without any additional implementation or revalidation. How fast are online-data distributed to the client? Online data can be distributed by a TCP-IP stream to the client. The number of data which can be transmitted is limited by the network bandwidth and the speed of the connected client application. We use an LDAP System for storing our User Account Information. It is possible to replace the User Management System from SpaceMaster by a different one? The SpaceMaster user management is separated from the access right management. Other user management system can be adapted by configuration. Why is the client application based on Eclipse? The Eclipse framework provides a robust user friendly and well proven extensible environment for client applications. *Channel: A place where the data (Sample) i.e. a measurement signal or a calculated value are stored at. Data from different sources (sensors) are normally stored in different channels (each sensor is associated to its own channel). Together with MUSC - the Microgravity User Support Center of DLR S.E.A. presents two posters at the ESAW 2011. The posters can be downloaded from the download area.